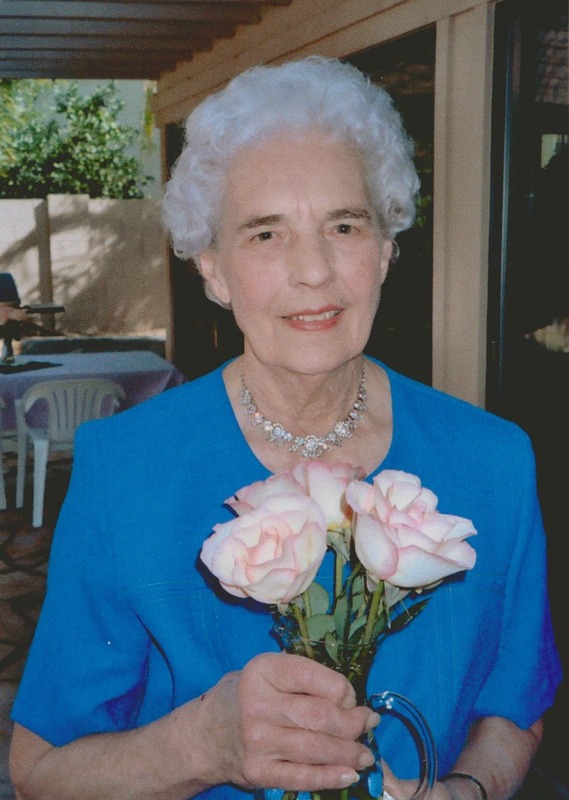 We invite you to join us in celebrating the life of Ruth Lillian (von der Linde) Bailey, 93, of Mesa, Arizona, who went home to be with Jesus Christ, her Savior and Lord, on Thursday, August 10, 2017. Ruth was born to the late Adolph & Ida von der Linde on a farm at Swaledale, Iowa, on November 9, 1923. She grew up an “Iowa farm girl” and throughout her school days, was involved in basketball and marching band. She carried a love for music and sports throughout her life. Ruth graduated from Swaledale High School in 1940, moving to Mason City during WWII. Besides enjoying Big Band dances at The Surf Ballroom in Clear Lake, her favorite job was working as a “front desk clerk” at the Cerro Gordo Hotel. She loved meeting new people and they were sad to see her go, when in 1949 she married the late Milo Mack Bailey–a handsome guy working for AT&T, who was staying at the Cerro Gordo. His career with AT&T took them through 14 states, with one of her favorites being Arizona. During that time they welcomed 3 children before settling in Des Moines, Iowa in 1963. She raised her family in Des Moines and in 1979 had an opportunity to move to Mesa where she lived contently for 38 years in what she called her “own little corner of the world”. Ruth worked at “Lofty Lady”, an East Valley dress shop, where she often met-up with Iowa friends during their visits in the winter season. She was a stranger to no one, with a smile and encouraging word for everyone. Ruth lived independently until age 92, and every day she had a goal to “get things done”. She never lost the qualities of a strong work ethic and instilled the same in her family. Ruth was a member of Grandview Park Baptist Church in Des Moines and Calvary Baptist in Mesa. Gifted with a “servant’s heart”, she faithfully served in the AWANA program in both churches for over 40 years, along with playing piano for Sunday School, assisting with clerical duties in the office, and ready to help when needed. Ruth was a breast cancer survivor and although she suffered physical setbacks in many areas, she never complained of the pain and limitations, but rather gave praise to Jesus each day. She enjoyed travel, sports (rarely missing a Suns, Cubs, or Diamondback game), gardening, playing games with her friends, and shopping! Ruth is survived by her 3 children, Rhonda Maddex Porter, William (Teresa) Bailey of Des Moines, Iowa, and Bobbi (Jonathan) Dodson of Silver City, NM., along with 2 grandsons, Bradley (Beth) Bailey and Bryan (Ashley) Bailey, great grandchild, Brijet Bailey, niece-Patricia Elliott, nieces and nephews of her late brother/wife Elmer and Bernice von der Linde, cousins including Millie (von der Linde) Pals/98, and her “adopted” family of dear friends–most particularly Donna Molgard for being her best friend and the very best Angel anyone could ever have. To the staff of Lindsay Manor and Integrity Hospice, there are hardly any words to express our heartfelt “Thank you” for the respect and loving care shown to “Mama Ruth” the past 11 months. We could not have asked for any better care and support for our mother and our family as you walked with us through this journey. Services in AZ: On Friday, August 18, 2017, a visitation will be held at 10:30am with a service at 11:30am at Bunker Family Funeral Home, 3529 E. University, Mesa, AZ. In Iowa: On Thursday, August 24, 2017, a visitation will be held from 5pm to 7pm at Grandview Park Funeral Chapel, 3211 Hubbell Ave., Des Moines, IA. A brief graveside service and interment will be held on Friday August 25, 2017, at 10:30am, Pleasant Valley Cemetery in Swaledale, IA. Memorials may be given to Calvary Baptist Church, 3810 E. University, Mesa, AZ., 85205, for Camp Tishamingo or your favorite charity. I am Glad to have known Ruth. She will be missed by many. My Prayers to all of Her Family. Ruth (Rufus) was my Mom’s (Millie von der Linde Pals) dearest cousin. She and my Mom enjoyed a lot of adventures together in their younger days. Mom took comfort in the fact that they still had each other in spite of the physical afflictions they both endured in their last years. What a blessing to know there is eternal life for believers like Ruth and Millie. Sue & I are adding condolences to all your family regarding your loss. You know someone is a wonderful Mom when her children turn out so wonderful. It doesn’t just happen. I loved Ruth and her servant’s attitude. I always knew she would have the Awana supplies on hand that were needed to keep the program working smoothly. I also enjoyed watching some of the biggest and most exciting Suns games with her in her condo or talking D’back news with her. Even after we moved to Arkansas we enjoyed occasional calls from her and sure did have a good trip to visit with her when we were back in Mesa visiting six or seven years ago. I was privileged to call her my friend. I am praying for Bobbi and the family in their loss and rejoicing to know that Ruth is enjoying the glories of heaven today. My condolences to the family of Ruth. Having grown up next to Ruth’s parents I got to know Ruth, Mack and the kids. I remember Ruth’s distinctive voice and her calm assuring nature. She had a genuine love for people and always took the time to visit with my parents when she came to Swaledale. I know she is rejoicing in heaven today and maybe playing a piano duet with my mom. To Mrs. Bailey’s family, I’m very sorry for your loss. I wanted to offer you some comfort that I’ve found in the Bible. In John 11:25 Jesus said “I am the resurrection and the life. The one who exercises faith in me, even though he dies, will come to life.” It’s my hope that you can draw comfort and strength from this promise that we can see our loved ones who have fallen asleep in death again.